In exactly a year from now, Sweden will go to the polls to elect a new government, and it seems certain that the far-right Sweden Democrats party will further cement their place in parliament, and possibly even support a conservative coalition government. The rise of the party – and the normalisation of their nationalist agenda – over the past decade has been accompanied by a more toxic fringe with clearer ties to extra-parliamentary far-right and neo-Nazi-movements who have identified established journalists as a barrier to the re-assertion of traditional Swedish values. Buoyed by the success of populism in mainstream politics, neo-Nazi groups such as the Nordic Resistance Movement (NMR) have become more visible and the NMR will this year protest outside of the Gothenburg Book Fair, a hub for Swedish publishing and journalism which symbolises the “cultural Marxism” the far right assert has ruined the country. The sight of Nordic white supremacists rallying at such a huge cultural event is though merely the tip of an invisible iceberg of intimidation and opposition to Sweden’s cultural and journalistic community by the far right. A survey by Swedish public TV’s Kulturnyheter editorial desk of five major Swedish media outlets found that the overall level of threats to journalists was increasing, as were the amount of incidents filed with the police by journalists or their employers. Attacks range from low-level intimidation and character assassination on social media to direct and persistent death threats. A now-removed website recently named a list of journalists it deemed traitors – alongside politicians and other public figures – with a call for violence against them. The relationship between the Sweden Democrats and the networks that seek to intimidate journalists is not straightforward, but party figures have been connected to the site Granskning Sverige for example. Granskning Sverige was implicated in misinformation campaigns against journalists through selective editing of interviews, and party figures shared Granskning Sveriges content whilst party spokesperson Adam Martinnen gave his approval of the site in an interview. When the newspaper Expressen revealed the names of the people behind Granskning Sverige, its editor in chief was visited in their home by two supporters of the site. A common belief amongst conservatives and the far right is that journalism is a hotbed of far-left politics. Mats Qviberg, a former financier who purchased and then sold a share in the Metro newspaper, recently said of his own staff that there were “Stalinists” who needed to be “cleaned out”. Her misgivings are backed up by statistics. A recent survey by Gothenburg’s school of journalism, media and communication run in coordination with the Swedish Journalism Union concluded that threats were an everyday reality for a majority of Swedish journalists. Thirty percent had been directly threatened and two-thirds had been the subject of derisory comments or assaults on their integrity. Thirty percent also said they avoided tackling controversial subjects in order to avoid harassment. 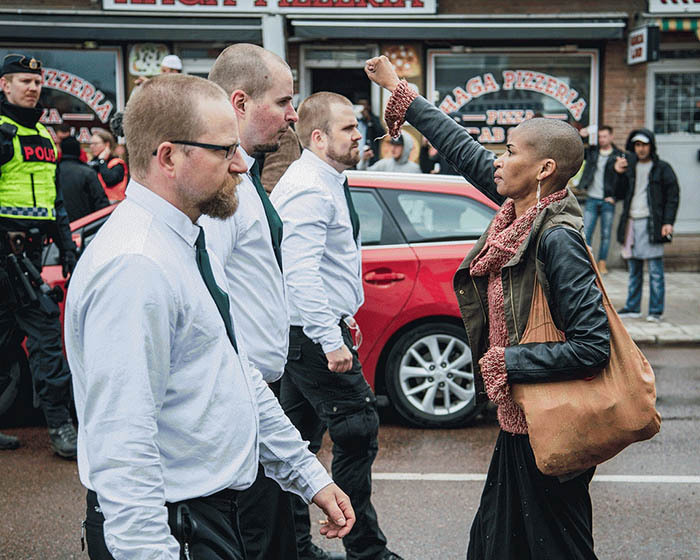 In July the Swedish minister for Culture and Democracy, Alice Bah Kuhnke, unveiled a strategy spearheaded by the Fojo media institute at Sweden’s Linnaeus University to protect journalists and tackle threats and intimidation, aiming to support the location and prosecution of harassers or those posing a danger to journalists, elected officials and artists. “The problems with hate and threats to journalists have escalated in recent years and constitute a considerable threat to Sweden’s democracy. In their latest report, the Swedish Civil Contingencies agency suggested that an inquiry was needed to increase the legal protection for journalists reflective of the seriousness of threatening and harassment to representatives of the media industry. That same report says that threats and provocation of journalists are particularly serious because they are working in the service of democracy,” says Kersti Forsberg, Fojo’s director. Worryingly for a profession built on democratic values, another significant element in the Swedish picture is declining trust in the media among the Swedish population. A book and report by researchers at Gothenburg found that trust in the media fell noticeably the further right voters identified on the political spectrum, peaking amongst supporters of far-right politics. Even more noticeably, the study showed that 54% of those surveyed felt the media was not reporting on the negative social consequences of immigration in Sweden. Rather than merely being the work of a small group of individuals, opposition to journalists and intimidation is now a relatively mainstream undertaking when seen in the context of mistrust of journalistic institutions. Swedish journalism, which has often been a benchmark for institutional strength and which takes its role as an important organ of society seriously, faces new threats, and the establishment of populist right politics as a permanent fixture has put it under more pressure than ever. Rather than merely being a target for individual threats and harassment, journalists in Sweden are realising that significant sections of society see them not as guarantors of democracy but as a partisan threat which needs to be neutralised. Well, you’ve been lied to by the Western press about Poland. And you still believe them. I have no idea what to think about Sweden. Liberalism in Poland meant a foreign-owned economy with workhouse-style threats. Children of the poor were routinely taken into care … by Liberals. 500,000 children lived on pork dripping in our Brave New World. Poland was a poster boy for globalism – and yet 2 million Poles emigrated. And you don’t ask why the united press story in Britain makes no sense – even when 800k Poles arrive in Britain. In 1989 there was no restructuring of the economy. People like the current editor of the Economist oversaw an economic Lebensraum policy, using the fundamental corruption of the post-Communists (remember Lech Walesa was a Communist agent). The rise of the Internet blew the post-Communist stitch-up away. Now we’re running a budget surplus, enjoying real (not statistical) economic growth and the birth rate has gone up 18%. But because German and French companies are having to pay tax, it’s illiberal. Incidentally, the judiciary – you might like to know that we had a husband and wife team heading the Constitutional Tribunal and the Supreme Court. Long-serving Communist Party member Mr Zdziennicki and his wife Ms Gersdorf – though we did have a stint from Mr Rzeplinski – infamous for stymieing an investigation into the Communist murder of troublesome priest Fr Popieluszko and an employee of George Soros (Human Rights Watch). What is the situation really like in Sweden?